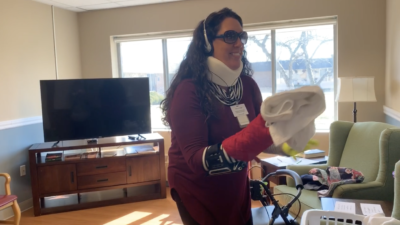 Recently, employees at the Western Michigan skilled nursing facility, SKLD Zeeland, joined a dementia simulation so that they could experience firsthand what it is like to live with cognitive and physical impairments associated with the disease. The Gilead Memory Care Unit at SKLD Zeeland is one of the largest and most comprehensive facilities in the Western Michigan area. This means that finding ways to provide better skilled nursing care for patients with dementia and Alzheimer’s disease is a constant priority for the staff. SKLD Zeeland staff member attempts to fold laundry during a dementia simulation training session. This simulation was a first step in improving care for patients with dementia. Administrators plan to continue to provide education to all of staff about how to best handle the unique behaviors of those diagnosed with dementia. They also plan to provide training on how to implement interventions that can minimize these behaviors and reduce falls. Keenoy says continued training is crucial, due to the size of the facility’s memory care unit and the number of residents who struggle with the sundowning effect (confusion more prominent later in the day). She and Rachael plan to transform one of the day rooms into a sensory stimulation room, using black out shades, soothing blue lights, tactile objects and fiber optic lamps to create a space that is proven to have positive effects on the mood and behavior of those with dementia. Improving behavior and mood in this population is closely correlated to fall reduction. With so many patients served in the memory care unit at the skilled nursing facility, finding ways to improve their level of care is essential.